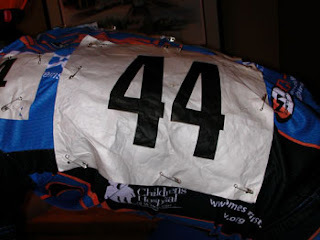 One of the basics every bike racer has to learn to do is pin on your race number. While it's not difficult, it helps to follow a few basic tips. Well positioned number with the ideal 8 pins. Do not use the pre-cut holes in the corner of the numbers—ignore them as these will cause your number to flap in the wind a lot. Just pin right through the surface of the number. For more details about how to pin your number, check out the Cycling Skills blog post on the topic.